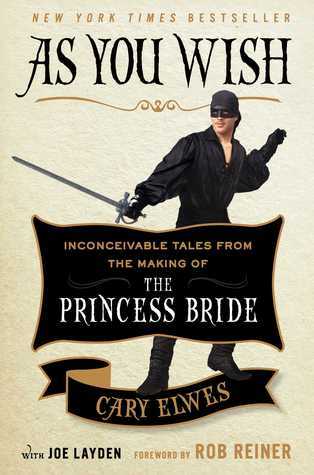 Like many other I adore The Princess Bride ( The book and the movie) so when I saw this at the library I snatched it up finally having some time to myself I sat down and read it in one sitting. This was defiantly a fun behind the scenes look at the making of The Princess Bride from Cary Elwes point of view. There was also snippets from the other cast and crew members and the author of the book that made it even more enjoyable to read. I learned so much information about the movie that I didn’t know and gained much more admiration for everyone that helped put such a wonderful movie together. It just shows how much people loved the book and that when they finally get a great director and amazing actors and crew member who most shared the same admiration were able to pull off such a wonderful film. I loved reading all the stories Cary and the other crew members had about Andre the Giant. They all seemed to have adored him so much and it was hard not to pick up that adoration. As for the writing itself it took me a bit to get used to. There was a lot of “ I’ll get to that later” or “ Thats another story for later” stuff like that that at first drove me sort of bonkers but as I kept reading it I got used to the informal flow of it and just started enjoying it. Even the snippets of dialogue on the side of the pages drove me crazy at first but I got used to it. And of course after you get done reading it you’re going to want to put the movie on and pick out the parts that was talked about. Definitely one for the fan of the movie and the book. Humorous, fun, informative, sweet read.